When Elspeth Noblin dies of cancer, she leavers her London apartment to her twin nieces, Julia and Valentina. These two American girls never met their English aunt, only knew that their mother, too, was a twin, and Elspeth her sister. Julia and Valentina are semi-normal American teenagers—with seemingly little interest in college, finding jobs, or anything outside their cozy home in the suburbs of Chicago, and with an abnormally intense attachment to one another. They are twenty. The girls move to Elspeth’s flat, which borders Highgate Cemetery in London. They come to know the building’s other residents. There is Martin, a brilliant and charming crossword puzzle setter suffering from crippling Obsessive Compulsive Disorder; Marjike, Martin’s devoted but trapped wife, and Robert, Elspeth’s elusive lover, a scholar of the cemetery. As the girls become embroiled in the fraying lives of their aunt’s neighbors, they also discover that much is still alive in Highgate, including—perhaps—their aunt, who can’t seem to leave her old apartment and life behind. 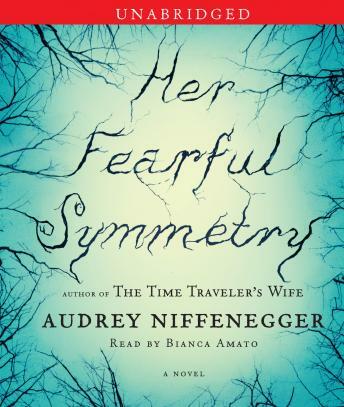 Niffenegger weaves a captivating story in Her Fearful Symmetry about love and identity, about secrets and sisterhood, and about the tenacity of life—even after death. Two freakish, immature, tepid, spoiled & unappreciative characters ruin people's (including each other's) lives in this bizarre supernaturalish yarn featuring adolescent-type characters yearning for middle-aged men (a distasteful theme present in the author's more famous book as well). A couple of interesting characters kept me from giving up on finishing. While the characters were initially engaging, the plot points soon turned ridiculous and monotonous. This attempt at a ghost story was anything but "fearful", often resorting to feeble comedic scenes just to expand the length of the tale. Wanted to like it because Time Traveler's Wife was so incredible. In the end, this story was just not believable. I am so happy I came across this book. Not having read anything else written by this author, I wasn't sure what to expect. This book kept me intrigued and interested the entire time and the author's voice was soothing and lovely. I agree with the prior review that the build up of the plot was so long and the climax was so abrubt and just strange. To me it seemed like there would have been countless other ways to solve Valentina's dilemma...it was a bit radical and quite risky. The characters were all very complex and believable until the climax involving Ellspeth, Robert and Valentina. No believable character would have ever agreed to "it" under the circumstances. (Wish I could say more but I don't want to ruin the plot twists). Prepare for a sad empty ending...but it really could not have ended any other way. Plot sorta happened--all of a sudden one character wants to die and this sets actions in motion. Most main characters are hard to like (or to be curious about). Writing and audio performance are lovely. Wow! This book had me at hello. From the first sentence I was enchanted, and my interest never wavered until the end. Then I felt like I had lost a friend. The writing is superb and the narrator had a gem of an English accent.